With summer now a distant memory, we turn our attention to preparing the garden for spring. A few weeks ago I was on my hands and knees in a garden in Kew, laying down wire mesh to ‘squirrel proof’ some crocus bulbs to protect them from hungry pests. So, why did I go to all this trouble when I could have had my feet up with a cup of coffee instead? In short, bulbs are easy to grow and extremely versatile. They can be used to fill spaces before shrubs and perennials start to grow and are perfect for adding colour to spring borders. Bulbs can be layered in pots, planted at the base of a tree or naturalised in a lawn. Another joy of bulbs is unearthing new favourites – the pure white Narcissi Thalia and the extremely reliable Allium ‘Purple Sensation’ are two I can certainly recommend. Purchase bulbs about a week before you plan to plant them. The warmth of your home may lead them to sprout prematurely, so it’s best not to leave them lying around too long. Plant autumn flowering bulbs such as nerines by late summer and daffodils, crocuses and hyacinths at the end of September. Alliums, crocosmia and lilies should be embedded in September and October and tulips in November. So what about technique, “How do I plant them?” Dig a hole with a bulb planter or trowel, place your bulbs in the soil with the shoot facing up and plant at two to three times their depth. Space at least twice their width, then replace the soil you removed and firm it in gently. Finally of course, water them. And finally, don’t scrimp on your bulbs, make an impact by using 25-50 bulbs for a good display. Also, select ones which grow to different heights and aim for successional planting whereby different bulbs flower at different times – prolonging the colour in your garden. As I recently discovered on my allotment, over time, some bulbs naturally produce baby bulbs. These can be removed when lifted for storage and planted or potted on to create more plants. With a growing penchant for tulips, I’ve selected Angelique, Apricot Beauty, Candy Prince and Spring Green for a double border which I will plant up in November. Get ready for a riot of pretty pastels when we share our photos with you next spring. What bulbs will you be planting for spring? Leave a comment on the blog, I’d love to hear about it. Top designers such as Andy Sturgeon and Cleve West cut their teeth at this event many years ago, and today it continues to nurture some of the UK’s most talented up and coming designers. With competitors showcasing conceptual gardens, show gardens, summer gardens, and designs restricted to specific budgets; there was something to inspire everyone this year, particularly those of us with small spaces. Some of the gardens which attracted the most attention were the bijou plots which stood cheek by jowl along the Ditton Avenue strip. Young designer Alexandra Froggatt’s ‘Garden of Solitude’ punctuated the end of this grand allée. Alexandra Froggatt won the Your Garden, Your Budget category with her blissful space. My favourite design of the show, it’s washed out wooden decking, vertical water drops and angular sculptural features culminated in a highly distinctive design. Alexandra’s inspiration stemmed from the colour, translucency and shape of crystals. There were no predictable orange and blue plant combinations here (Is it just me, or has the achillea/eryngium combo become a bit too ubiquitous lately?). Instead, nectar rich white and muted pastel blooms were combined with ferns and grasses and the soothing sound of running water. Where other designers had used black dye to colour the water in their gardens to give the illusion of a bottomless pool, Alexandra’s jets and pool were filled with refreshingly clear water, inviting you to reach out and make a splash of your own. Of course for most owners of small gardens, low maintenance, privacy and screening is a must when deciding what they want in their outdoor space, and these were the guiding principles behind Chew Valley Trees’ ‘Green is the Colour’ garden. If like me you feel comforted by the shelter and protection of a natural woodland environment, you would have loved this garden. Inspired by the magical forests of eastern Canada, the spirit of this landscape was captured to create a secluded place of reflection. The planting scheme combined restful shades of green foliage, while densely planted evergreen trees formed a textural backdrop to the garden. Canada wasn’t the only country horticulturalists channelled for ideas. Using his native Australia for inspiration, Jim Fogarty’s ‘Essence of Australia’ garden secured him the top award this year – best show garden. If you prefer to walk on the wild side, then Essence of Australia would have really rocked your world. This laid back haven for tropical garden lovers celebrated Aussie plants and contemporary design. Native Australian plants that can be grown in the UK delivered a touch of the exotic, whilst the red sands, curved billabong and winding Rainbow Serpent deck lifted the lid on a whole new world in landscape design. Gardens aside, there was also the usual vast selection of stalls and interactive installations on offer at the Hampton Court Palace Flower Show. In short, visitors were in for a treat. What was your favourite garden at the Hampton Court Palace Flower Show this year? Feel free to share your views by leaving a comment. 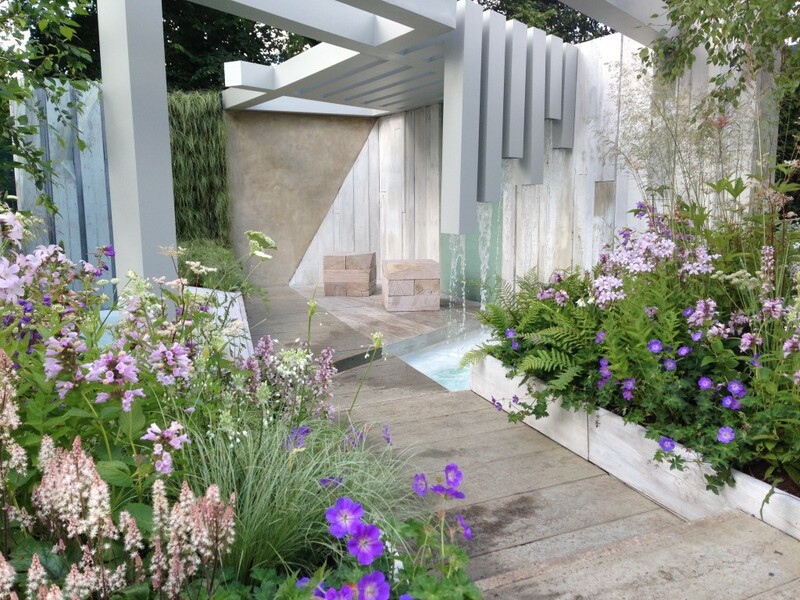 A year since my first visit, I returned to the Chelsea Flower Show eager to see and do more. I’d managed to secure planting work on two gardens (the Positively Stoke-on-Trent and the Big Green Egg trade stand) so set to work weeding out plants that had ‘gone over’, replacing them with picture perfect shrubs and perennials. I’d immersed myself in the press previews this time around so had started to piece together the jigsaw of who was doing what and with who. Cleve West and Luciano Giubbilei were back for another year, with 20-something first-timers Hugo Bugg, Matthew Keightley and the Rich brothers snapping at their heels. Although I’d gained a sense of many of the designers’ concepts, only by being there did I get a sense of the relationship that coexisted between different plants and features in each design and what they meant to me. Almost every garden was exceptional. Contrasting with many of the designers’ berry hued combinations, Luciano’s brave yellow planting for Laurent-Perrier presented a new frontier. He cleverly juxtaposed an organic cedar sculpture with the sharpness of a grey stepped stone pool. Cleve’s heavenly hot and dry Islamic inspired garden for M&G delivered pure bliss. The Telegraph garden from Paul Gazerwitz and Tomasso del Buono unfolded slowly, with exquisite details delighting you at every turn. On the downside – and I am being super critical here – for me Gavin McWilliam and Andrew Wilson’s Cloudy Bay garden narrowly missed the mark due to the finishing on the charred oak backdrop. I cannot help but compare it unfavourably to the charred oak surround on Christopher Bradley-Hole’s gold award winning Anglo-Japanese masterpiece last year. I loved the modern furnishings and planting so this was regrettable. Although it had some merit, I felt Paul Hervey Brookes’s BrandAlley garden was a little old fashioned. The pool was too dominant, leaving me gasping for a hit of fresh foliage and the wild planting on the nearside didn’t successfully blend with the rest of the design. The unsung heroes of Chelsea I think are the designers of the fresh category and artisan gardens. Slightly below the radar, these smaller show pieces are packed with personality. Personal favourites include the cube water feature in the Royal National Institute for Blind People’s garden from designers Alex Frazier and Tom Prince. I was also fascinated by the charming Togenkyo Japanese garden by Ishihara Kazuyuki. With its intriguing moss balls and fairies’ dell cuteness, it had visitors swarming round it like bees around a honey pot. Irises, foxgloves and umbellifers were indeed in abundance but is this such a big deal? Chelsea designers – like the rest of us – fall prey to trends every once in a while and who can blame them? What did you think of the gardens at Chelsea this year? Share your views by leaving a reply. 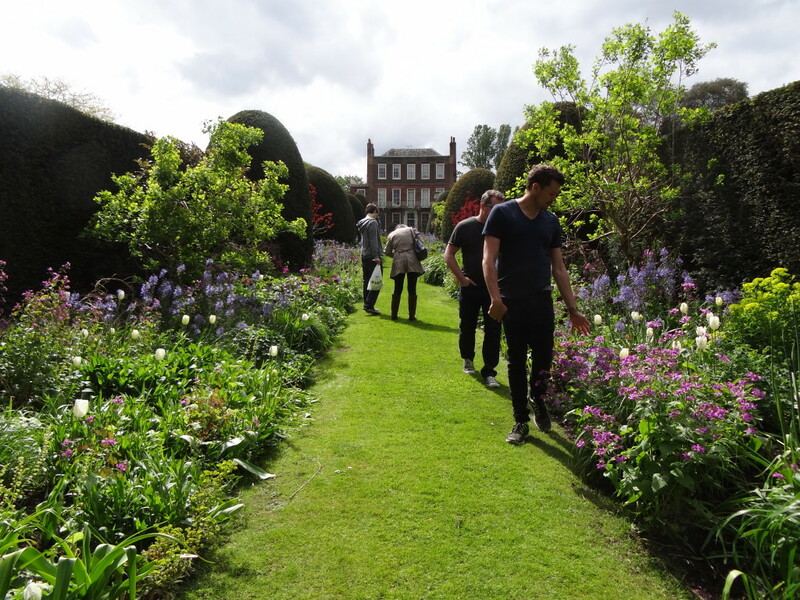 Petersham House garden, the private garden of Petersham Nurseries’ owners Francesco and Gael Boglione opened to the public today to raise funds for registered charity, the National Gardens Scheme. Having recently gardened in the grounds and nursery, Touch Landscapes’ owner and principal designer Georgina Chahed attended the day, joining former colleagues from Petersham Nurseries. Dozens of visitors admired the 150″ long double borders full of early flowering perennials and colour from the abundant spring flowering bulbs including tulips and Narcissus. Visitors were also granted exclusive access to the productive vegetable garden with chickens. Garden designer from Touch Landscapes, Georgina Chahed commented: “I am thrilled that Petersham House has once again opened its doors to the general public. Petersham House garden is just one of many outstanding gardens included in the National Gardens Scheme that offer visitors the opportunity to relax and take in their breath-taking surroundings, whilst gaining valuable design inspiration and planting ideas”. Visitors were able to purchase key plants featured in the Petersham border from the adjoining Petersham Nurseries and recreate the magic of the architectural planting scheme in their own garden. 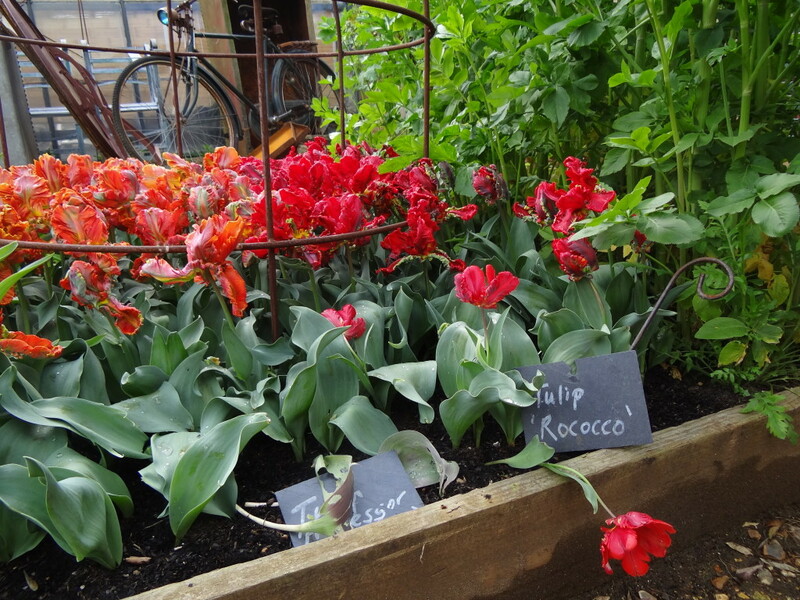 Petersham House garden will also be open to the public on Sunday 20 July 2014. Founded in 1927, the National Gardens Scheme opens thousands of exceptional gardens throughout England and Wales to raise money for nursing and caring charities. Most of the gardens are private and not normally open to visitors.